Finals week is almost here, many of us are in the lull before the storm when it comes to the world of academics. In the words of Dr. 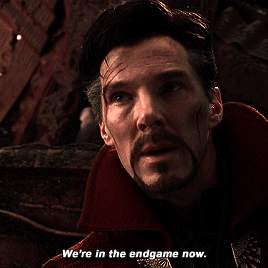 Strange from Avengers: Infinity War, “We’re in the endgame now,” the semester is not over just quite. For some people, these next few weeks of studying may make or break their grade for a class. Here at the Office of Continuous Improvement we hope that you all finish strong. Don’t fret, there are some tools used in Lean culture that can be applied to academics. These are things such as: fishbone diagrams to help find the root cause of a problem, personal kanbans to help keep track of what needs to be done, and 3S for a quick cleanup of your work space (discluding standardization and sustainment for now). As you can see there are plenty of Lean tools to help you out. If you’re not doing great in a class but can’t figure out why, try making a fishbone diagram or use another tool to get to the root cause of why you may be struggling. Correcting the root cause could give you the boost you need in order to do well these last few weeks and help prevent you from repeating the class or doing the same thing in one of your next classes. A personal Kanban can also be very useful in helping you keep track of what needs to be done and how much you have already done. Personal Kanbans also help with the separation and prioritization of tasks to complete on a daily basis so due dates don’t sneak up on you and you can see what days will be busy with assignments, allowing you to manage them accordingly. Keeping a personal Kanban can help with the balancing of classes, homework, studying, as well as work and while keeping it all in one place. It has been suggested that people study better when they are in a clean space. When I am studying my desk usually looks like a mini tornado just passed over my desk. If that sounds familiar, then it may not be a bad idea to do a quick 3S of your work station during a break in your studying. For many people cleaning may even help relieve stress and clear the mind, making it easier to get back into the swing of things after your break is up. Plus, then you get to start up again at a clean work space. Finals season can be very stressful, especially dividing up study time accordingly and making sure you finish strong in your classes. It may seem as though your life is out of your control, having something in place to either keep a hold of your life or take it back can help take some stress off of your shoulders. These are just some of the Lean tools that may be useful to you during these last few weeks of the semester. If you would like to learn more about these or other Lean tools, feel free to reach out to our office for more resources via email at improvement@mtu.edu. Great tips Mitchell. Doing these things can really help students be successful. Thanks for sharing.